The world-renowned and universally-acclaimed Altec-Lansing A7 Voice of the Theatre speaker-system is back. Well, to be honest, it's been back for some time now, and it can be yours for somewhere around six-grand - each (as @ '06). That's $12,000 per pair, obviously - available only from the 'factory'. But is it really worth it? This version, of the A7, dubbed the 'Legacy', was re-introduced early in this new millennium (around '02/'03) by the current owners of Altec-Lansing. But since WAJ on AUDIO only hit full-stride in 2010 perhaps this will partially explain the lateness of my comments on the legendary Voice of the Theatre, in the context of the good news of its re-introduction. Ever since I was a boy attending high-schools' athletic-championships at the, albeit, small 28,000-seat local stadium in which these championships were held annually, I'd always been fascinated with these speakers. I wondered how just 12 of these speakers (placed on the the perimeter of the infield, on the inside of both the athletics-track and a wide cycle-track, and aimed at the 'stands, as they were) could fill a stadium even of this size and, indeed, overpower the voices of 28,000 screaming teenagers. I wondered how these speakers could be so unstrained, and how the sound of music and the voice of the announcer could be so natural, as the sound was projected to me way-up at the very back of the grand-stand, my favorite vantage-point, perhaps close to 100 meters away. This was most fascinating since, from where-ever one would sit in this stadium, only one of these 12 speakers was aimed in one's general direction. One speaker each, theoretically, supplied the sound for over 2,000 students, in the most unfavorable of circumstances - very impressive, indeed! The same speakers and speaker-configuration were used, much more regularly, for school-boy football-matches at the same venue, at which I was a regular attendant. So, since age 12, and thru-out my high-school years, I became very familiar with the sound of Altec-Lansing's A7 Voice of the Theatre. Speaking of which, the A7 also provided the sound in some of the theatres/cinemas, which I also happened to frequent, and was also extremely popular in its usage for this purpose world-wide. A7s were also popularly used for sound-reinforcement at musical-concerts, from the smallest to the largest. (In fact, though JBL speakers are commonly believed to have been the speakers of choice at, perhaps, the biggest and most famous rock-concert-festival ever; Woodstock, some contend that the bass-bins in those stacks were actually A7s - for whatever that is worth). Additionally, at age 16, I discovered what was to become one of my favorite mobile-DJ pro-sound systems, 'The Ecology Force' - a musical force to be reckoned with, at high-school dances, graduation balls, barbeque/dances, and fetes, at which I also happened to be a regular attendant. This awesome-sounding system (to me, at the time) also sported a small barrage of the versatile, and supremely capable, A7s. Many other such systems also used them. To say that I became a fan of the Altec-Lansing A7 would be an understatement. In fact, I built a modified version (several truncated cabs with 2x12" drivers, each) of this iconic speaker for use in the top-end (midrange/treble) system of my own pro-sound rig, some time after high-school. Nevertheless, I'd always felt that such systems, while awesome in the professional realm, were less than refined in a domestic setting. So even thru-out ownership/operation of my pro-sound rig(s) my domestic speaker-systems were always (well, not always) much more 'refined', and representative of conventional (high-end) thinking. (My current concept of the ideal domestic speaker has evolved to be now centered between the 'rawness' of a pro-rig, and the 'refinement' of the typical domestic speaker-system - a reflection of my perception of the sound of live acoustic instruments). The truth is that, were it not for my intolerance of typical midrange horn colorations, A7s (or Klipschorns) would've been the providers of sound in my own domestic system today (Tannoys were also considered, bye the way). A brief explanation: Around 10 years ago, after long endurance and utter frustration with so-called state of the art conventional speakers, I was determined to find a pair of Klipschorns for use in my system, though I was also apprehensive as to whether I could live with such horns' colorations - it turns out I could not. But, in my experience, very few of today's typical speakers can duplicate the overall realism of the afore-mentioned, for various reasons (those reasons are articulated in other articles here). During my search for Klipsch, a pair of Altec 19s, sans one woofer, fell into my hands - at significant cost, considering the condition of the cabs, etc. (The plan was to replace the water-damaged 19s' enclosures with the prefered 825/828 cabs of the A7 - the drivers of the 19 are identical to those of several versions of the A7). I quickly discovered there's no way I could live with the aforementioned colorations in a domestic setting. So I ended-up building my own DIY system along the lines of my 'ideal' concept, stated above. The Altec's high-frequency compression driver (without the original horn-bell) is the only part of that Altec system currently used in this DIY system since its high-efficiency and dynamism cannot be approached by many of the popular alternatives. However, those who might be interested in this great speaker should not be deterred by my own abandonment of it. I certainly will not sit here and tell you that midrange horn colorations are not an issue. But the truth is, though I have no regrets about my current choice, if I'd known then what I know now, a modified A7 (or Klipschorn) might well have been my reference speaker today. The fact is that these 'colorful' midrange horns can be substituted by others which do not display similar characteristics. But, also, the original horns can be treated (modified) with tar, felt, or other materials, to tame said colorations, as many have done, with varying degrees of success - so this needn't be a deal-breaker for those interested. Components & Characteristics: The traditional Altec A7 is a combination horn/bass-reflex 2-way speaker system. A compression horn provides mid/high-frequencies above 500 or 800hz, depending on the x-over/h-f units of the particular model. (The current system's x-over is quoted at 900hz, I believe. This presents a paradox since this current version is purported to be an exact replica of one of the vintage models. Perhaps there was a 900hz version, unbeknownst to me, after all. This is quite possible since there was, indeed, also a relatively unknown short-lived 1200hz version - no-doubt utilizing the same x-over unit of the Model 19). High-frequency drivers were the equivalent of Altec's less-costly units, such as the 802 or 806 (there were several variations, and designations) and the h-f horns were generally the less-costly sectorals, such as the 811 for the A7-800, crossed-over at 800hz, and the 511 for the A7-500, crossed-over at 500hz. Below this range, a 15" driver coupled to a front-loaded horn/bass-reflex combination-enclosure supplies lower-midrange, and lively bass. Compared to my other (non-West-Coast) vintage favorites; the folded-horns of the Klipschorn and Tannoy's Westminster, deep-bass from the A7 is virtually non-existent (for my use, a sub-woofer would be a prerequisite). But the bass it does supply is supremely authoritative, 'solid', and even exciting, to a very large degree, albeit seemingly exaggerated, and with a slight touch of 'boom' simulating extension - for those who like that type of sound. One could describe the typical A7's mid-bass as somewhat larger-than-life(like) - though correctable by way of modification. [Note: Though several different high-frequency driver/horn combos would have been used over many years, arguably, the woofers had the most effect on the difference in sound between the different models, including the most recent. So, in the interest of brevity, perhaps we should concentrate on those: The Altec 416 woofer - a clone of the former '803', both commonly utilized in previous A7s - is mainly responsible for the A7's reputation, especially regarding mid-bass performance. This is the woofer most loved by A7 afficionados who're mainly into the likes of rock & roll and disco-music, and this is the woofer for which the A7 was originally intended, so far as I'm aware. See comments below, however, about the less 'enhanced' mid-bass characteristics of Altec's '515' woofer, relative to its performance in the A7, or in the, more expensive, A5's identical enclosure. (Comments about exaggerated bass do not apply to this combo, which is more accurate than the cheaper, and perhaps more popular, 416-equipped alternative. In addition to the 515, as is installed in the current version, further upgrading the h-f driver to something like Altec's 288C, with an uncolored tar-filled multicellular horn like the 805B, for instance, and suitable x-over, would bring the system to Altec's more desirable A5 level, superior to the A7 and most other contenders, with the potential to be modified for even greater performance surpassing virtually all others). In terms of mods, woofer-options from other brands are also viable, sans the 'Altec-Sound', of course (but I'd stick with the-above Altecs, since very, very few can match their 'designed-in' lower-midrange performance capabilities, and overall musicallity, in the cab of the A7/A5). Despite the use of other Altec woofer-alternatives in the A7, 416s and 515s are the better choices, in my estimation. The 421, for example (a musical-instrument speaker) may be OK, with slightly 'improved' low-bass, but not as good as either of the two in their areas of strength, in an A7 (hifi) application, or in overall performance. The same applies to the 411, in my view - in fact; any alternative to the 416 or 515 may be 'OK' - but certainly not ideal. Interestingly (in modifying or building one's own A7/A5) the '515' seems very attractive, as a basis, for those seeking more 'mid-bass neutrality' than that of the 416, for instance, while significantly enhancing other desirable aspects of the famed sound of Altec (ie; clarity, liquid-lucidity, lower-midrange prowess, and high-efficiency/dynamism - though I'm not too sure about the efficiency of the current '515' units) a sub-woofer is even more essential here, in my opinion. According to an article by Greg Boynton, in 'Sound Practices' magazine, issue #1, 'reprinted' by 'Enjoy The Music'; by the profile, constitution, and suspension of their cones, 515s were optimized for a x-over point no higher than 500hz, while 416s were designed for cross-over anywhere up to the 800hz region, or there-about - DIYers; be advised. Yet, I'm reliably informed that the 515(-8G) - as supplied in the current 'Legacy' model - is one of perhaps two exceptions, in the 515 series, in that they were designed for operation up to 2.5 khz. So the current model's high crossover-point should not be an issue. [Interestingly, for those who may have wondered why these Altec drivers are so superior to most others at the lower-midrange, etc., I believe that (in addition to substantial cone-surface-area and enclosure-volume, which most similar competitors also have, to their credit, in also enhancing lower-mids' realism) manipulated parameters, including those articulated by Greg Boynton, are among the reasons why. A few others, such as; Bozak, Tannoy, the Henry Kloss designs, and the even more ancient designs from RCA and Western-Electric, along with perhaps precious few others, do display outstanding lower-midrange characteristics. But the vast majority of others do not - especially today. It's also particularly remarkable that none of the otherwise excellent JBL mid-woofers are as good, at lower-mids, as either the Altec 416/604 (which share the same cone/suspension, I believe) 515, or the 12" 414. Since J.B.L (the man, himself) had been there at Altec, one would have expected his products to have, at least, equaled the Altecs in one of their most outstanding traits. But then, that's only my opinion. Now excuse me while I beat a prudent retreat from the subject before projectiles start flying from the direction of irate JBL fans. If not augmented by super-tweeters and sub-woofers, speakers like the A7 may not be as extended at the very highest and lowest frequencies as some of today's state of the art equivalents, especially those so equipped. However, a listening-session with a slightly modified pair of A7s driven by appropriate (preferably tubed, or tube-like) electronics and a competent (preferably analogue) source, is one of the finer experiences in life. (It matters little that, in this instance, such a session was necessarily conducted in a friend's garage, since his wife had banned this, admittedly and especially, shabby-looking pair from the house - pending suitable W.A.F.-related refurbishment, presumably). The 'fittingly' shabby state of our environs did little to detract from our wonderment at these relics' ability to conjure such a realistic portrayal of a live musical experience. Extreme highs and lows are hardly missed (many recordings, arguably, do not broach the specified limits anyway) as one is enraptured by the dynamic ebb and flow of musical notes, and the realistic tones of those notes, as supplied thru these 50-odd year-old classics. One is especially struck by the realistic level of midrange-presence, tone, and dynamic nuances (micro and macro) unapproachable by modern 'equivalents'. Lower-midrange prowess - in closely depicting the realistic tones, overtones, harmonics, timbre, and resonances of actual instruments operating in this region - is far superior to that of today's examples, most of which literally ignore this critical region altogether, in my experience. I reiterate; TONE and DYNAMICS account for such speakers' superiority, over modern examples, at replicating LIFELIKE REALISM - lifelike midrange-presence is also a factor. Huge speaker-cone surface-areas, operating thru the lower-mids from huge enclosures, combined with high-efficiency, are the reasons behind these speakers' superiority, in these areas. The typical modern inefficient speaker-system - with its single, or double, small-coned mid/woofer(s) operating thru the lower-mids with their puny inadequate surface-areas - simply cannot offer similar performance in dynamics, midrange-presence, or (lower-midrange) tonality. Therefore, they CANNOT begin to approach a similar level of REALISM - it's as simple as that. Their prominence in the treble-region - seeking 'sweetness', 'air', and detail, and tilting the tonal-balance even further out-of-true - exacerbates the problem, and further deviates from overall realism! In further describing the tonalities, let's consider some of the characteristics of milk. [Yep, I did say; milk!] I know this may sound ridiculous, but bear with me. Let's say that, in midrange tonality; (a) Live Music = Cow's Milk (the genuine article, straight from the cow, full of body and somewhat, but not overly, sweet. (b) Classic Speakers (like the A7) = Pasteurized Cow's Milk (as supplied in the carton - processed, but still very close to the real thing in perceived 'sweetness' and, especially, body and taste/tonality - specifically regarding the WHOLE of the midrange. (c) Most Modern Speakers = Sweetened Condensed Milk - mixed-out to a thin constitution, with sugar added (very sweet and thin, and very nice in its own way, but not closely representative of the real thing - mids are too thin, and trebles too 'sweet' - if this type is your preference, however, then stay away from speakers like the A7). And let's look at dynamics in a similar manner; (a) Live Music = A Roller-Coaster Ride (a thrilling and exciting experience as one is taken thru the highest peaks and lowest valleys of the ride - the dynamics of the music itself). (b) Classic Speakers (like the A7) = Another Roller-Coaster Ride (only very slightly less thrilling and exciting than the original, the difference here is almost negligible - an awesome ride, virtually indistinguishable from the original - recordings permitting). (c) Most Modern Speakers = A Merry-Go-Round Ride ( nice, with minor ups and downs, or peaks and valleys, but much less than the real thing, the original roller-coaster ride, and ridiculously much less thrilling, or exciting, than the real thing). The Altec A7 may be my third choice in the trio of classics I've mentioned in this piece, but it's certainly no poor-relation to these others. In fact, one could argue that it's more accomplished than both. (Not necessarily so, in my opinion, mind you, but 'one could argue....'). Nevertheless, the A7's quality, and the significance of its acomplishments, are the stuff of legend: Its production-run lasted from the mid 50's to nineties - over fifty-years (if we also count the years since its recent re-introduction). For very many years A7s were, arguably, the world's most popular studio-monitors. At one stage, there were more Altec A7s and 604s doing such duty than all other studio-monitors combined, allegedly (Tannoy aficianados, worldwide, may present strong arguments to the contrary, though). Aside from its common-place usage in many of the better recording-studios, and sound-reinforcement applications, not to mention the homes of discerning audiophiles, A7s were also popular in very many of the world's cinemas/theatres. (This is where the series of Altec-Lansing's speakers - to which the A7 belongs - got the name; The 'Voice of the Theatre', VOT, or VOTT, as they're popularly called). It would be virtually imopssible to exist on this planet without being exposed to Altec's A7 VOTT, in some way, even today, as we listen to recordings influenced by them, and attend cinemas which are absolutely proud to use them. I believe it's one of the great speakers ever produced - with awesome potential, in which, I believe, its greatest value lies. Appropriately modified versions have the potential to outclass any example, from whatever era, in absolute realism, in my opinion. Indeed, a version from The Voice of the Theatre line, dubbed the A5 (very similar to the A7) extensively modified by the famous Jean Hiraga, is reputed to be just that - one of the most realistic reproducers of sound ever built. Aspects of these mods are available on the 'net, for those sufficiently interested (the 'critical' cross-over circuit is here) though I'm not sure ALL aspects were made public. Though this piece was inspired by the fact that the current owners of the Altec-Lansing name have seen fit to release a version of the A7 in today's market-place, a commendable effort, this article should not be viewed as a whole-scale endorsement of that particular version, as I do have a couple of 'concerns' with it. I would, however, whole-heartedly encourage anyone so inclined to build (or have built) their own version of the original A7, incorporating all the mods that make this great speaker even greater. This piece should, ideally, be seen more as a pointer in that direction, encouraging the requisite research. spectrum for two hours duration. BINDING POSTS Two pair. Jumpered for mono wiring. Concerns: Before closing, I should point-out that one of the 'concerns' I have, with the latest version, is with its price-tag. Against the back-drop of the $4k-odd Klipschorn - with its cheaper drivers, but much more intricate, labor-intensive, and much more expensive folded-horn bass-bin - it's difficult to see the justification for paying more for a much simpler and cheaper design. Especially since the bass of the Klipsch is superior to that of the A7. (Not that the A7's bass is 'bad', especially with the 515 woofer - further improved after mods, and the addition of a sub-woofer - but I believe the Klipsch's bass is the better of the two speakers', in standard form). If based primarily on bass, my advice to those with 12-grand to spend (on a brand-new, plug-and-play, speaker-system) would be to buy the Klipsch, and keep the change. I'll reiterate from another angle; if accurate and slightly more extended bass is a priority, the K-horn is, arguably and by a small margin, a better speaker than this current version of the A7 (in standard trim) in my opinion, despite the latter's advantage regarding versatility in placement options (the Klipsch must, ideally, be corner-placed). If, however, the time alignment of drivers (impossible with the Klipsch) and/or a better-quality mid to lower-midrange and upper mid-bass performance, take precedence over the slightly more extended or 'satisfactory' overall bass of the Klipsch, in one's opinion, then the A7 rules. (Perhaps I should revise my own order of preference, regarding these two classics, after all). The point is; both speakers may be close, with the ultimate choice dependent on one's preferences. But in terms of their 'over-the-counter' prices, the Klipsch is the run-away winner. Yet, viewed against the back-drop of the prices of the modern, even 'state of the art', speakers which can't compete with it in realism, the price of the A7 seems that much more attractive. If the Klipsch is eliminated as an option, for whatever reason, then the A7's price-value quotient can scarcely be challenged, considering its awesome performance and, more importantly, its even more awesome performance-potential. Everything is relative - the facts are on display - and the choices are yours to make! 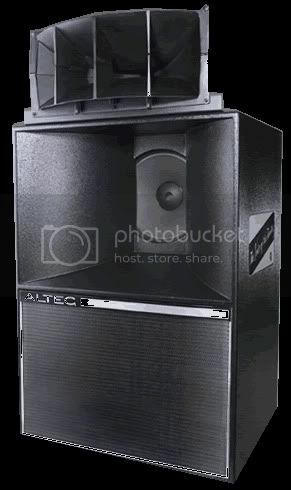 One of several possible explanations could be that; Altec's 416 woofer is less efficient than the 515, though it does supply the enhanced mid-bass 'Altec-Sound' prefered by many, in the A7's '828' enclosure. But their more expensive, and also currently-utilized, 515 woofer is supposed to be even more efficient, with even better lower-mids, and less exaggerated mid-bass - perhaps potentially more accurate overall, if combined with a good sub-woofer, but not especially favored by die-hard afficionados of the 'Altec-Sound' - please note the implications. One, therefore, wonders whether a mix-up has caused the efficiency-rating of a less efficient 416-equipped A7 to have been quoted, instead of the true efficiency-rating of the 515-equipped unit currently marketed. Or could it be that the latest 515 is less efficient than previous versions? According to the original Altec specs, this 515-8G should have a sensitivity of 105db. Cross-over losses would not have lowered that figure by much - unless the bass of this 515 is so much lower in level, than that of its mids, that those mids have to be lowered drastically, in sensitivity, to match the relatively reticent bass. Whether my 'woofer-theories' help to explain the disparity in efficiency-ratings, or whether the original efficiency-ratings for the A7 (103db, especially) had been 'over-estimated', I'm not sure. But if the current factory-offered A7 is, indeed, 97db efficient, while the less expensive Klipschorn is at 104db (with 'better' bass to boot) then, I believe, this is enough to give one cause for consideration, especially in light of the vast difference in price. The foregoing notwithstanding; the A7 is much easier, and less expensive, to build (or have built) than a Klipschorn - or a Tannoy Westminster, for that matter (a used A7 is another cost-effective option). And a custom-built A7 or A5 costing less than a new Klipschorn, and incorporating the mods of a Jean Hiraga, for instance, would be, absolutely, superior to unmodified examples of both my other vintage favorites, not to mention virtually ALL typical modern state of the art designs, in several aspects, not least; overall REALISM - at much less cost. Indeed, compared to the $100k+ prices of similar modern (horn) examples, even the price of the latest A7 'Legacy' edition (as a basis for the inevitable mods) seems a 'bargain'. Conclusion: Make no mistake, there's no magic involved in the building of those outrageously-priced modern horn speakers - despite what their makers would have you believe. The formula, in most cases, is simple; copy the original classics (in principle, generally, and pretty-much completely - with minor changes - in some instances) and incorporate updated components where necessary. (Pioneer's TAD division is one good source for such updated, arguably improved, compression-drivers, for instance). The same can be done with the original vintage designs that are being so delligently copied (and is done by a few of the more astute amongst us - with spectacular results, at unbelievably resaonable costs, relatively). A suitably updated and modified classic can be just as good, or better than, the the 200-grand examples which copy these classics today. So, instead of fantasizing, and lusting after the super-expensive copies, one could actually avail one's self of one of the originals which equal, or possibly surpass, these 200-grand clones, at a minor fraction of the cost - after suitable mods. Believe it, or not! If the lifelike and realistic reproduction of music is your main priority, then consider a build of a modified A7 (or even the purchase of the latest edition, if so inclined - caveats notwithstanding). Apart from the K-horn (even Tannoy's latest Westminster is no bargain, at $36k) others that are similarly capable are priced starting in the vicinity of the current A7 'Legacy' version (the excellent Edgarhorn Titan, for instance) to levels that may only be aptly described as stratospheric. Formerly conservative (deep-pocketed) audiophiles actually buy these stratospherically-expensive clones and rave about their REALISM - vastly superior to the expensive conventional speaker-systems they had been used to. So, how about owning and modifying one of the 'real-McKoys', and eliciting similar performance, for much less? I'll leave you now to give that some thought! The Altec-Lansing A7 VOTT speaker-system is - indeed - a legend in its own time, and beyond.